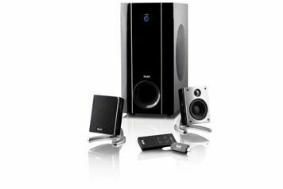 Teufel desktop speakers connect wirelessly to your PC | What Hi-Fi? The Concept C 300 Wireless package comes with a wireless integrated soundcard and USB wireless transmitter, enabling stereo sound to be beamed from your computer to the speakers. The powerhouse of the set-up is the CC 300 SW subwoofer, which functions as the bass speaker, stereo amplifier and wireless audio receiver in one unit. It uses a large, side-firing 25cm bass driver in the 40-litre wood enclosure. Inside the subwoofer are three amps, one delivering 140W to the bass driver, the other two delivering 30W to each of the satellite speakers. The CE 20 FCR satellites incorporate an 8cm midrange driver and 19mm tweeter. You also get a stereo wired input for owners who want to connect two devices; it can be used to hook up iPods, games consoles, TVs or a second computer. Teufel's Concept C 300 Wireless package is available now for £259 from the Teufel website.